NDL's fifth Bremen was built by Penhoët of St. Nazaire for the French Compagnie Sudatlantique and originally named Pasteur. Her maiden voyage, scheduled for 10 September 1939, was canceled due to the outbreak of World War II. After one Brest-Halifax trip with France's gold reserves, Pasteur entered service as a troop carrier in August 1940, under the British flag and Cunard White Star management. In June 1945, Pasteur returned to the French flag, and in early 1946 management was returned to Cie. Sudatlantique. Her service, though, remained military in nature. After her World War II trooping duties ended, Pasteur was used to transport French troops to and from Indochina. She earned the French Correct de Guerre for her service, but never made a commercial voyage for her owner. Laid up in 1956, Pasteur was sold to NDL in September 1957 and was rebuilt by Bremer Vulkan. 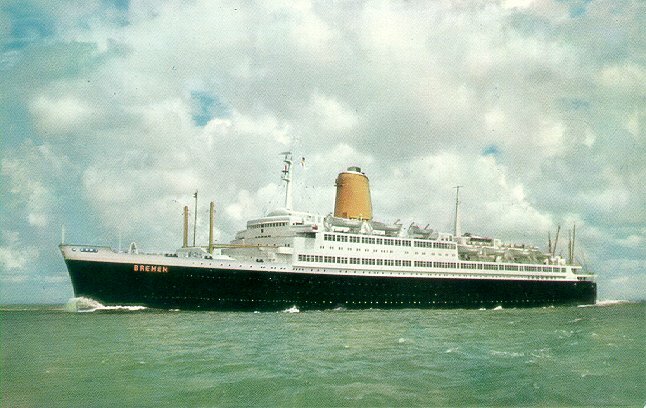 Renamed Bremen, she entered NDL service in July 1959, on the Bremerhaven-New York route. Also used for cruising, she became part of Hapag-Lloyd when the two leading German shipping organizations merged in 1970. Her final Bremen-New York roundtrip for Hapag-Lloyd came in September 1971. Bremen was then sold to the Greek Chandris Line and renamed Regina Magna. In 1977, she became a Jeddah barracks ship for Philippine workers, called Saudiphil I. On 9 June 1980, while being towed to Taiwan for scrapping, the ship (now called Filipinas Saudia I) turned on her port side and sank stern-first in the Indian Ocean. Sources: Hansen's Passenger Liners from Germany; Bonsor's North Atlantic Seaway; Kludas' Great Passenger Ships of the World.